Last update I showed a quick shot of # 1628. It is a GT500 4spd car. I thought I would do something a little different on this page. While I will follow the restoration, I wanted to show you some of the original parts that have come off the car. This white Shelby started off at Jack Loftus Ford in Chicago, Illinois. The second and long time owner sold the car to John. John had known about the car for over 30 years. A mere 24,000 miles had ticked off the odometer. The car was complete missing only the air cleaner and the original distributor. When I first saw the engine, I had some doubts. 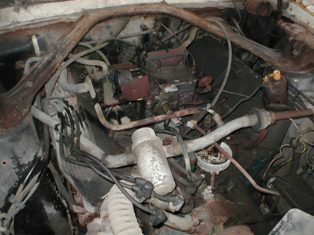 The car was equipped with thermactor and the carburetor was not the commonly seen Holley. I also noted there was no emission decal. 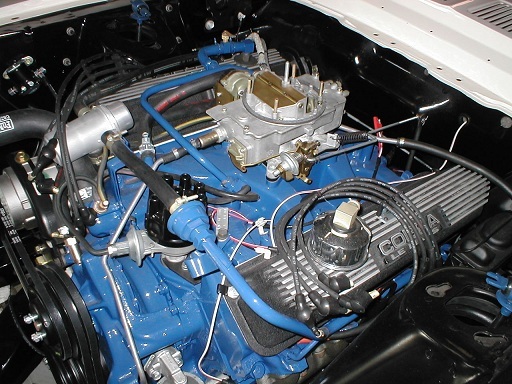 I asked several people if they had ever seen the AUTOLITE carb on a GT500. The answer I commonly got was...."NO". The other comment was "Have you painting without a dusk mask again? The paint fumes have got to you." 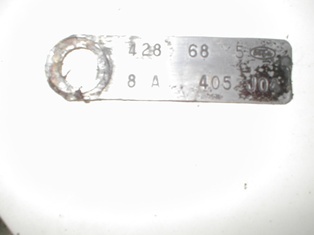 A gentle cleaning of the carb tag revealed the "C8AF-9510-AE" part number. The date code was one month before the build of the car. 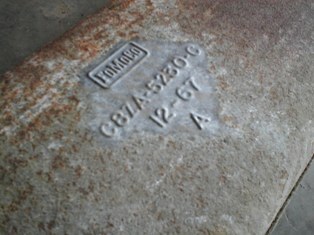 Part of this number was also stamped on the base of the carb. I was able to locate a service bulletin from AO Smith describing a modification to the carb. That could only mean, at least some of these carbs did make it on to GT500s. I am unsure of how many. When I visited the Shelby convention, I was able to find yet another GT500 with the same AUTOLITE carb. 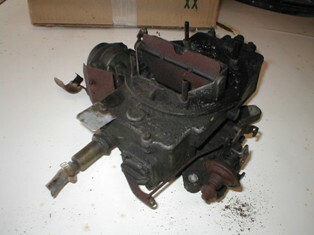 I wonder how many times this carb has been discarded during a restoration? It is very rare to see an original muffler. Most were discarded a long time ago. This car had the entire factory installed exhaust system intact ! Because this is a GT500 the system has the 2 inch pipes. Here's one people always ask about. When I removed this master cylinder brake cover it did not appear to have any black paint on it. In most cases I have found they are painted from the factory. A closer examination revealed the black paint still present, but only under the original decal. The vaccum hose to the booster was intact. 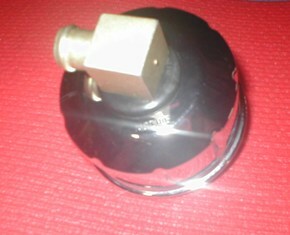 It revealed the valve was actually white plastic. 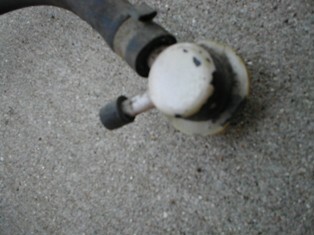 The valve was painted black with the brake booster. I also noted the small, rubber cap had a flat end, not a rounded one. 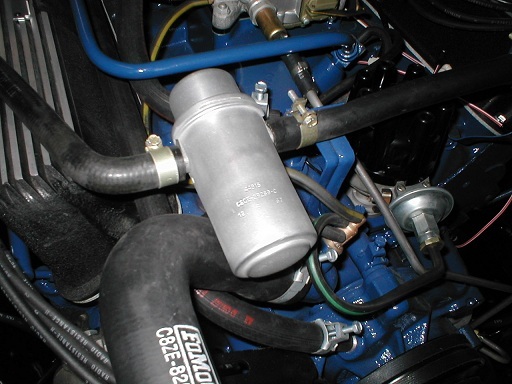 Later cars used a black plastic valve with the word "MANIFOLD" on it. The original engine tag is always a welcome find. The codes on the tag correspond to the build sheet and the engine. The good thing about low mileage cars is USUALLY the hardware has not been messed with too much. These three screws came from the taillight panel. On the left is the screw that holds metal plates to the body. It is a phosphate (dark gray) drill screw. 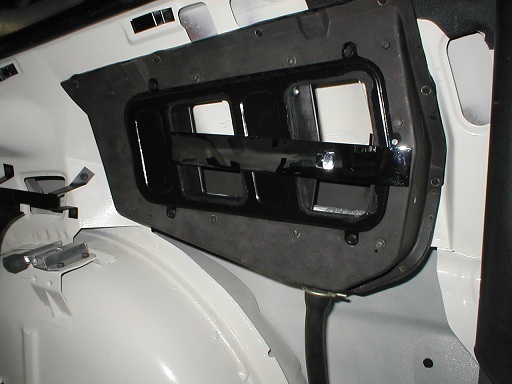 On the right is the screw for the rubber shield that hides behind the bumper. It is also phosphated. 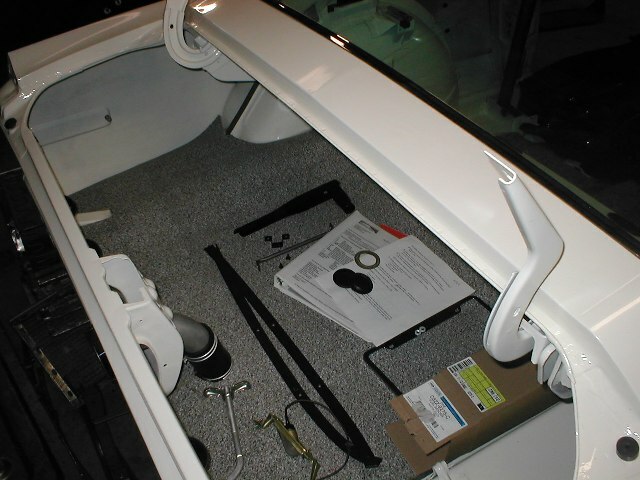 In the center is the screw that holds the fiberglass panel to the body. Can you tell the finish? It is silver cadmium. Judges like to debate things like proper finish on bolts and screws. You can see from this example why determining the proper finish on hardware is sometimes difficult. 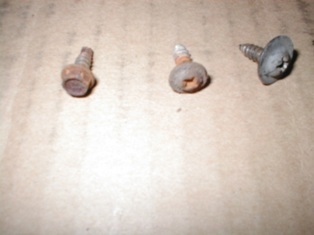 The two rusty screws look the same until you examine them very closely. # 1628 is currently getting body and paint. I continue collecting, cleaning and sorting original parts. I wanted to show you this motor mount. 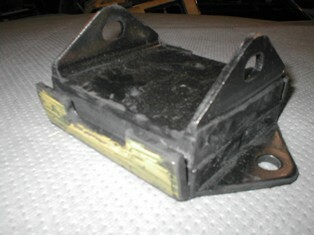 It is an original "New Old stock" motor mount insulator. It has a D1ZZ part number. The original motor insulator is actually a C8ZZ part. 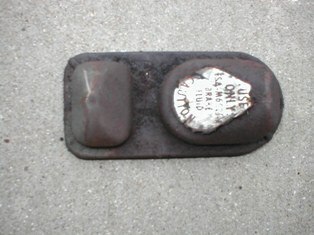 You can see this insulator has a yellow id mark on it. The original insulators have a red mark on them. This is the clutch pedal removed from the car. You can see it is a FORD service part by the parts label. Most production parts do not carry these labels. 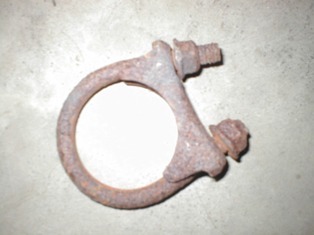 This is an original exhaust clamp. You don't see those too often. 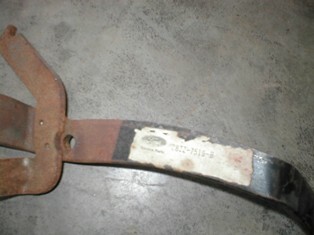 It is a 2 inch saddle type clamp. Recently, some nice reproductions became available. Original AUTOLITE oil caps were always a concern. Finding a new old stock (NOS) cap is very hard. If you do find a cap, you could expect to pay a handsome sum. The other option was buying a rechromed cap. I never liked the look of the rechromed caps, because they looked, well...like rechromed caps. This cap is actually a new reproduction. The fitting has been replated. These caps are very nice and sell for around $35. 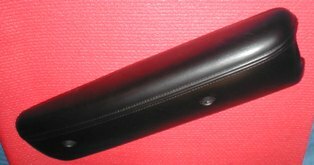 It is unrealistic to think you will find all original parts, so finding good quality reproductions is important. Sometimes a good cleaning is all that is in order. These belts were disassembled. 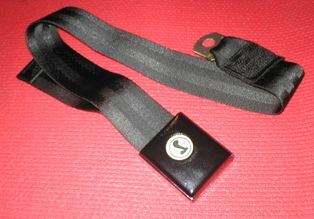 The buckles were throughly cleaned and the covers were repainted. I washed the belts in the washing machine. It is best to do this operation when your wife has gone shopping. Even though the interior of the car had seen better days. 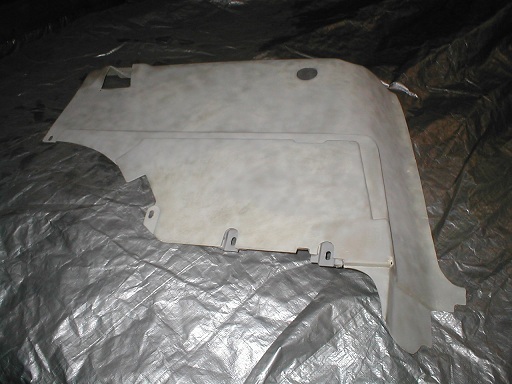 A good cleaning and a light coat of vinyl dye can make original parts look like new. 1628 is looking much better. The body man has one small panel left to replace. I am hoping this car can be in final primer very soon. 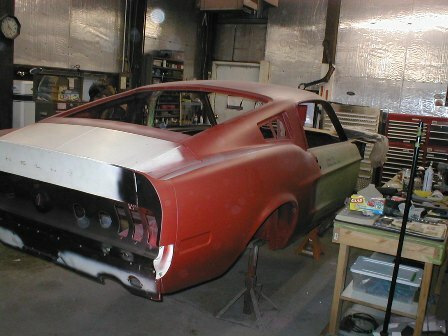 The rear fiberglass has been refitted to the car and all of the lines have been squared. 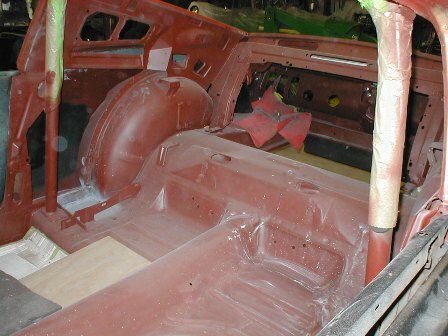 The process of restoring the body shell can be long and full of pit stops along the way. It may seem like a never ending flow of money, but the end result should make it worth it. The floors look better than ever and a clean up is in order. This car will certainly be getting a lot of attention in the future. We often forget about all those things in life that create set backs for our best intentions. 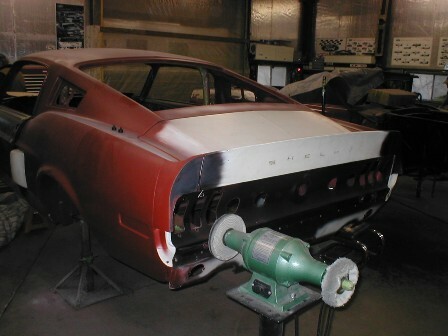 It has been three years and many things have have influenced the restoration of this original GT500. The economy is one, those special relationships we have with family and friends is another. I think you will agree # 1628 has turned the corner and is ready to be among the most elite cars in the country. 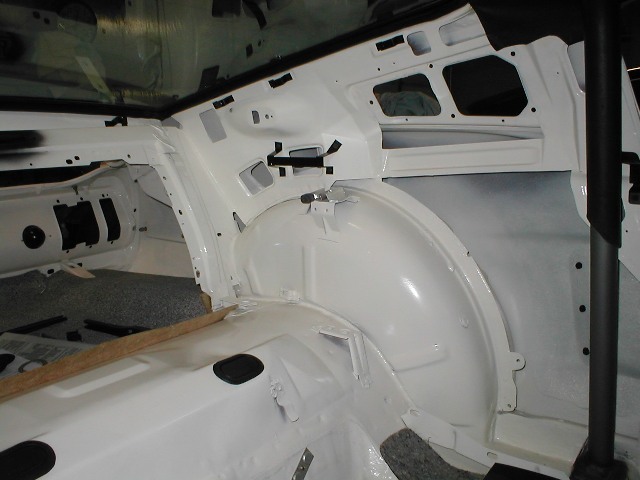 The original body shell has been massaged and now sports a fresh new coat of white. I think it looks great ! 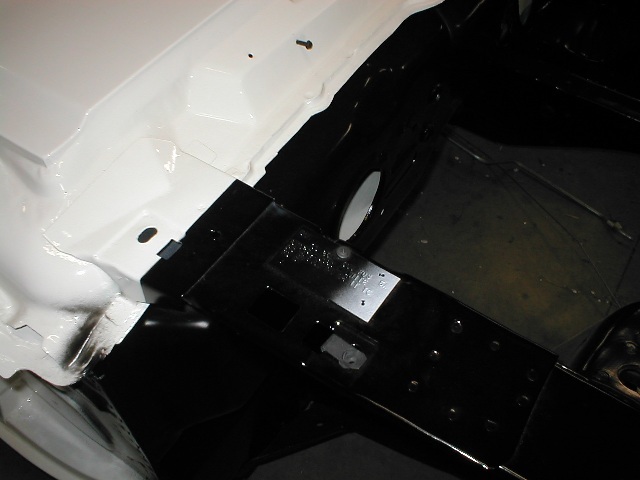 I think the one thing that can really set a car apart from the others is a correctly painted floorpan. Sure, most people will never take the time to appreciate the hours of labor needed to do it correctly. Here is the bottom. Notice how the white has drifted in towards the center of the car ? Once there are a few shiny pieces of chrome and some blue stripes on this car it will really pop. I think the most important things are doing your research and doing it to the best of your ability. 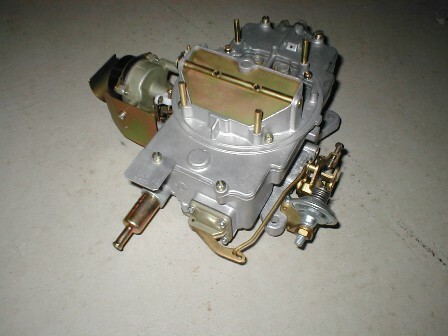 Remember that C8AF carburetor ? Well, it is ready to be reunited with the aluminum intake in the near future. The square identification tag is the original. I always keep them in a safe place when having the carb rebuilt. 1628 is finally ready to get some parts! This is an exciting time. This is the original build tag. You can see the factory had turned the tag when it was painted and then returned the tag later. Not all cars are like this, but I recreated the detail. Inside the car, I have set the carpet. 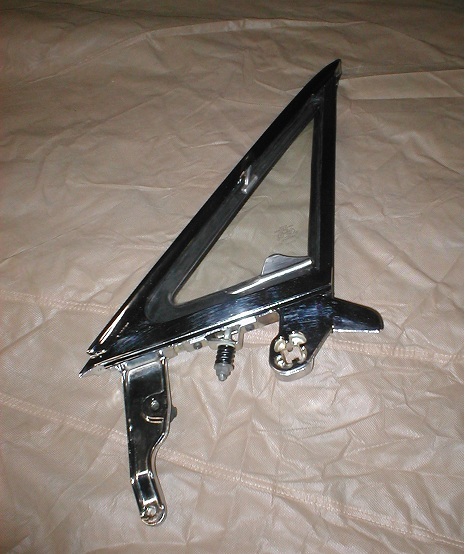 The interior panel brackets have all been cleaned and returned to their proper locations. 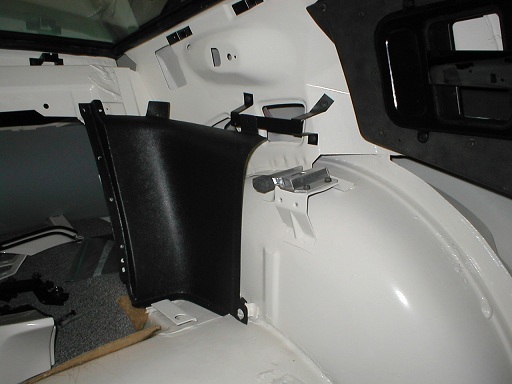 The headliner and rollbar have also returned to their original locations. 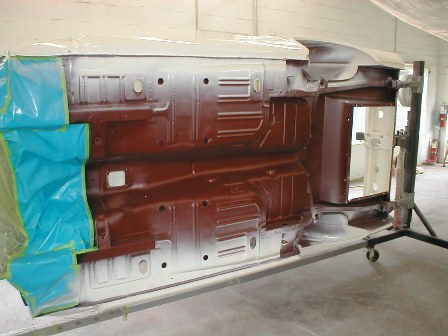 These large interior panels had to be cleaned and repainted. I use glass beads and a very light touch. If you have a small hole it can be repaired. The larger holes (like speaker holes) mean the part is junk. Rebuilding a vent glass frame is a project in itself. I like to rechrome the originals and clean all the hardware. 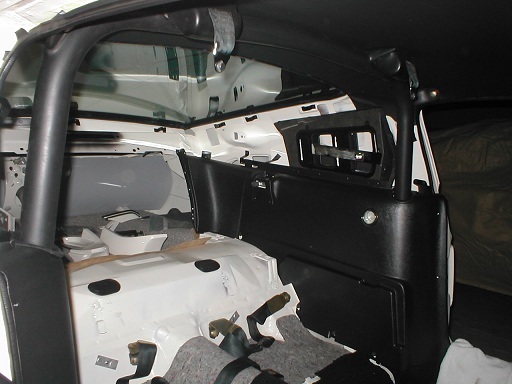 You need to assemble the overlapping interior panels in the correct order. This bottom corner panel is the starting point. I use the reproduction vent box for all the new parts needed here. I change out the hardware and reuse the original fiberglass plenum. Here is that big panel installed in the car. The folding seat assembly is next on the mini-list. The powerplant and transmission are back where they belong. 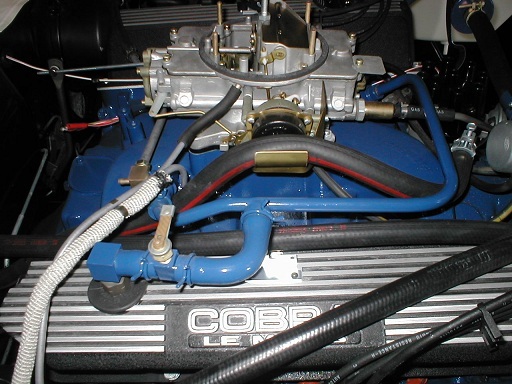 The fuel line is unique to this carb. I found this dated anti backfire canister on eBay. It is dated one month before the build of the car. You may have noticed the AUTOLITE carb. There is also a small vacuum valve on the pcv hose.